CHRISTMAS DECORATIONS: If you would like to help decorate the church for Christmas, please see the sign-up sheet on the bulletin board. Decorating will take place TODAY in the sanctuary at 1:30 PM. Please see Irene Couch for more information. PRISON MINISTRY: If you would like to be a blessing to the Halawa Prison Ministry they are currently in need of donations of Austin Variety Snack Pack boxes. They would like to bless the inmates with goodies at Christmas. There will be a sign up sheet on the bulletin board in the foyer if you would like to donate. Please bring any donations to the office by Today. Please see Pastor Gerard Tehotu for more information. YOUTH CHRISTMAS BANQUET: The Youth Group (Impact & Ignite) will be having a semi-formal Christmas banquet this Friday, December 4th from 6:30 to 9:30 PM at the Ewa Beach Golf Club. Our theme is “ccWonderland” so please dress for the occasion. Also, please make your payment as soon as you can. See Karen Tan or Nikki Pagan for more information. FOOD & FELLOWSHIP: Everyone is invited to join us for “Food and Fellowship” next Sunday after the 2nd service on the lanai. We will have hot dogs or hamburgers with chips and a drink available for a suggested donation of $1.50. This ministry is an extension of the Youth Ministry so for all the Youth in the Fellowship, please consider signing up to help in this event. See Hendrik Feliciano or Felix Tan for more information. LIVE NATIVITY DISPLAY: We have an amazing opportunity in the coming weeks to put together a live nativity display in the front lawn of our church during this Christmas Season. If you want to be a part of this ministry then please come to the meeting today after the 2nd Service in Classroom #1. Please see Alex Rodriguez for more information. CHILDREN’S CHURCH: The current quarter ends at the end of NOVEMBER, so please prayerfully consider being part of this extraordinary ministry next quarter beginning on December 6th, 2015. If you’ve been part of the fellowship for 6 months or more, we’d love to have you as part of the team that develops our next generation of Christian leaders. We STILL have need for Wednesday Evening Service NURSERY, so please prayerfully consider this area of need. Please see Pastor Dan or Karen Mancao, if you believe God is tugging at your heart to serve in this ministry. AWANA: There is still opportunity to register your kids as well as to tell your neighbors about this great ministry for kids from 3 years old to 6th grade. Please encourage your children who are registered to bring a friend. This Sunday’s theme is “Can You Do It Again?” and it is the last day of the canned food drive. Adults are still welcome to serve as a volunteer leader too. See Pastor Dan, Sarah Reed, or Susan Fuchikami for more information. MARRIAGE CONFERENCE: The “Art of Marriage” applies biblical truths to real-life issues to help couples strengthen their marriage and renew their relationship. Consider praying about attending this two-day event on Friday, February 6 from 7—9:30 PM and Saturday, February 7 from 9 AM—4 PM here at the church. There will be a one day registration on December 13 after both services. You may also sign up in the foyer. For more information, contact Raine & Rosie Lactaoen. MEN’S BIBLE STUDY: This study is currently going through the book of Jeremiah on Saturday mornings at 7:00 AM. So for all the men in the fellowship, please consider joining us in this study as we glean in the Word through the writings of the Prophet Jeremiah. Please see Whitney Vellalos for more information. MAHALO: Thank you to all those who participated in yesterday’s Thanksgiving Outreach. It was truly a blessing to have you there to help! OPERATION CHRISTMAS CHILD: If you are interested in being a part of Operation Christmas Child, the Packing Party is TODAY, Sunday, November 22rd from 1:00 to 3:00 PM on the Lanai. Please see Liz Santa Ana or Pastor Tau for questions. PRISON MINISTRY: If you would like to be a blessing to the Halawa Prison Ministry they are currently in need of donations of Austin Variety Snack Pack boxes. They would like to bless the inmates with goodies at Christmas. There will be a sign up sheet on the bulletin board in the foyer if you would like to donate. Please bring any donations to the office by SUNDAY, November 29th, 2015. Please see Pastor Gereard Tehotu for more information. SPECIAL MUSIC: We are blessed to have the group Temple Veil join us for both morning services on Sunday, November 29th. YOUTH CHRISTMAS BANQUET: Today is the absolute last day to sign up as a head count must be turned in by Monday. The payment must also be turned in as soon as you can. There are sponsorship available for those who might need assistance with the cost. The Youth Group (Impact & Ignite) will be having a semi-formal Christmas banquet on Friday, December 4th from 6:30 to 9:30 PM at the Ewa Beach Golf Club. The cost is $35 per youth which includes a dinner buffet, door prizes, and lots of fun. Space is limited so sign up as soon as you can. There is a sign-up table on the Lanai after each service. Please see Karen Tan or Nikki Pagan for more information. MARRIAGE CONFERENCE: The “Art of Marriage” applies biblical truths to real-life issues to help couples strengthen their marriage and renew their relationship. Consider praying about attending this two-day event on Friday, February 6 from 7—9:30 PM and Saturday, February 7 from 9 AM—4 PM here at the church. There will be a one day registration on December 13 after both services. You may also sign up in the foyer. For more information, call Raine & Rosie Lactaoen. CHRISTMAS DECORATIONS: If you would like to help decorate the church for Christmas, please see the sign-up sheet on the bulletin board. Decorating will take place NEXT Sunday, November 29th in the sanctuary at 1:30 PM. Please see Irene Couch for more information. THANKSGIVING OUTREACH: Each year we have been able to be a blessing to our elderly, less fortunate, military, and single parent families. Ko’Olina Resort will provide the food and we will serve our community with a complimentary Thanksgiving meal on Saturday, November 21st from 11:00 AM –1:00 PM. If you are interested in donating (plates, cups, utensils, and napkins), sign–up sheets are posted in the foyer. Please bring donations to the church by WEDNESDAY, November 18th, 2015. Trina Pagan will be outside after both services with Thanksgiving outreach tickets. OPERATION CHRISTMAS CHILD: If you are interested in being a part of Operation Christmas Child, the Packing Party is Sunday, November 22rd from 1:00 to 3:00 PM on the Lanai. Donations will be accepted on the lanai after both services or during office hours Monday through Friday. There is a sign up sheet on the bulletin board. Please see Liz Santa Ana or Pastor Tau for questions. GUEST SPEAKER: We are blessed to have Don Stewart scheduled to speak next Sunday, November 22nd at both morning services. Don is the host of the nationally known radio program “Pastor’s Perspective.” Please invite a friend and join us! YOUTH CHRISTMAS BANQUET: The Youth Group (Impact & Ignite) will be having a semi-formal Christmas banquet on Friday, December 4th from 6:30 to 9:30 PM at the Ewa Beach Golf Club. The cost is $35 per youth which includes a dinner buffet, door prizes, and lots of fun. Space is limited so sign up as soon as you can. There is a sign-up table on the Lanai after each service. Please see Karen Tan or Nikki Pagan for more information. CHILDREN’S CHURCH: The current quarter ends at the end of NOVEMBER, so please prayerfully consider being part of this extraordinary ministry next quarter beginning on December 6th, 2015. If you’ve been part of the fellowship for 6 months or more, we’d love to have you as part of the team that develops our next generation of Christian leaders. We STILL have need for Wednesday Evening Service NURSERY, so please prayerfully consider this area of need. Please see Pastor Dan or Karen Mancao if you believe God is tugging at your heart to serve in this ministry. AWANA: There is still opportunity to register your kids as well as to tell your neighbors about this great ministry for kids from 3 years old to 6th grade. Please encourage your children who are registered to bring a friend. This past Sunday was the beginning of the canned food drive and make a card for a soldier to send for Christmas. Adults are still welcome to serve as a volunteer leader too. See Pastor Dan, Sarah Reed, or Susan Fuchikami for more information. MARRIAGE CONFERENCE: The “Art of Marriage” applies biblical truths to real-life issues to help couples strengthen their marriage and renew their relationship. Consider praying about attending this two-day event on Friday, February 6 from 7—9:30 PM and Saturday, February 7 from 9 AM—4 PM here at the church. There will be a one day registration on December 13 after both services. You may also sign up in the foyer. For more information, call Raine& Rosie Lactaoen. MAHALO: A BIG THANK YOU to those women who helped and participated in yesterday’s Women’s Breakfast! THANKSGIVING OUTREACH: Each year we have been able to be a blessing to our elderly, less fortunate, military, and single parent families. Ko’Olina Resort will provide the food and we will serve our community with a complimentary Thanksgiving meal on Saturday, November 21st from 11:00 AM –1:00 PM. If you are interested in donating (plates, cups, utensils, and napkins), sign–up sheets are posted in the foyer. Irene Couch and Trina Pagan will be outside after both services with Thanksgiving outreach tickets. OPERATION CHRISTMAS CHILD: If you are interested in being a part of Operation Christmas Child, the Packing Party is Sunday, November 22rd from 1:00 to 3:00 PM on the Lanai. There is a sign up sheet on the bulletin board. Please see Liz Santa Ana or Pastor Tau for questions. GUEST SPEAKER: We are blessed to have Don Stewart scheduled to speak on Sunday, November 22nd at both morning services. Don is the host of the nationally known radio program “Pastor’s Perspective.” Please invite a friend and join us! volunteer leader too. See Pastor Dan, Sarah Reed, or Susan Fuchikami for more information. MOMS IN PRAYER: The Moms in Prayer group will be on break for the months of November and December and will resume again in January of 2016. MAHALO: A BIG THANK YOU to those who participated, volunteered, and donated to make last night’s Harvest Fest possible. We could not have done it without you and we just want to thank you from the bottom of our hearts! WOMEN’S FELLOWSHIP BREAKFAST: Attention Ladies! Just a reminder if yousigned up to attend the Women’s Fellowship Breakfast it will be THIS Saturday, November 7th, from 8:00 to 10:00 AM here in the sanctuary. If you are able to volunteer to help set up on Friday, November 6th from 4:00 to 5:30 PM for this event please see Irene Couch for more information. THANKSGIVING OUTREACH: Each year we have been able to be a blessing to our elderly, less fortunate, military, and single parent families. Ko’Olina Resort will provide the food and we will serve our community with a complimentary Thanksgiving meal on Saturday, November 21st from 11:00 AM – 1:00 PM. If you are interested in donating (plates, cups, utensils, and napkins), sign–up sheets are posted in the foyer. AWANA: There is still opportunity to register your kids as well as to tell your neighbors about this great ministry for kids from 3 years old to 6th grade. Please encourage your children who are registered to bring a friend Adults are still welcome to serve as a volunteer leader too. See Pastor Dan, Sarah Reed, or Susan Fuchikami for more information. THANKSGIVING OUTREACH: All Praise and Glory to God for allowing us to be a blessing to those in need each year with a complimentary Thanksgiving meal. We thank Ko’Olina Resort for providing the food and all who took part in the outreach. We greatly appreciate your prayers, donations, and awesome volunteer support in sharing the Love of Jesus to the community of Ewa Beach and the surrounding areas. CHILDREN’S CHRISTMAS SERVICE: There will be a meeting today after the second service in classroom #2 for all those interested in helping with the Children’s Christmas Eve Service Wednesday, December 24th at 6 PM. Please see Pastor Dan for more information. GUEST SPEAKER: We are blessed to have Don Stewart scheduled to speak next Sunday, November 30th at both morning services. Don is the host of the nationally known radio program “Pastor’s Perspective.” Please invite a friend and join us! UNPLUGGED: Please note that “Unplugged” is cancelled this Friday, November 28th. They will resume Friday, December 5th with guest speaker Don Stewart. Please see Pastor Felix if you have any questions. THANKSGIVING MEAL: If you need help with a Thanksgiving meal, please contact the church office or see Pastor Felix. OPERATION CHRISTMAS CHILD: The Packing Party is today at 1 PM on the Lanai. Please see Liz Santa Ana or Pastor Tau for questions. CHILDREN’S MINISTRY: The new quarter begins Sunday, December 7th. Please prayerfully consider becoming a part of this vital ministry and be blessed by the children as we reach their hearts for Jesus. Opportunities are available for teachers, assistants, and worship leaders. Full curriculum is provided. If you have attended CCWO for about 6 months and would like to serve, the sign–up board is located on the Lanai. Please see Pastor Dan, Karen Mancao or Amy Brumm for more information. Mahalo to all those who are currently serving this quarter! ROYAL KUNIA HOME FELLOWSHIP: The fellowship meeting Fridays at the home of Daniel and Maria Scheidt is on break from November 28th through December 12th. They will resume meeting Friday, December 19th at 7 PM. Please see Pastor Tau for any questions. PERFORMING HEARTS: Please note that the “perFORMING heARTS” ministry will not be meeting in November or December. Please prayerfully consider being a part of this drama ministry in 2015. For questions, please see Kim Jacobson. MEN’S SOFTBALL: Attention all Men! The 2015 softball season will begin January 31st. There is a sign–up sheet located on the bulletin board. Please see Jeff Schichi if you have any questions. MARRIAGE CONFERENCE: Please mark your calendar for Family Life’s, “the art of marriage–getting to the heart of God’s design” here on Friday, February 6th and Saturday, February 7th. There is a sign­up sheet on the bulletin board. Please see Rosie Lactaoen for more information. VETERANS DAY: We thank our Lord and express our appreciation for all Veterans as well as all the Military men and women serving our country. Please note that the church office and facility will be closed in observance of Veterans Day this Tuesday, November 11th. IGNITE & IMPACT: The Junior High (6th­-8th) and High School (9th­-12th) groups will be going to i­Trampoline on this Wednesday, November 12th. Please note that everyone participating should at the facility by 6:30 PM. Please see Pastor Felix for a permission slip. WOMEN’S FELLOWSHIP BREAKFAST: Ladies, we invite you to join us for a time of worship, prayer and fellowship this Saturday, November 15th from 8 – 10 AM in the sanctuary. Please sign up on the bulletin board TODAY so we can plan for food preparation. GUEST SPEAKER: We are blessed to have Don Stewart scheduled to speak Sunday, November 30th at both morning services. Don is the host of the nationally known radio program “Pastor’s Perspective.” Please invite a friend and join us! UNPLUGGED: Please note that “Unplugged” is cancelled for Friday, November 28th. They will resume Friday, December 5th with guest speaker Don Stewart. Please see Pastor Felix if you have any questions. CHILDREN’S MINISTRY: The new quarter begins Sunday, December 7th. Please prayerfully consider becoming a part of this vital ministry and be blessed by the children as we reach their hearts for Jesus. Opportunities are available for teachers, assistants, and worship leaders. If you have attended CCWO for about 6 months and would like to serve, the sign–up board is located on the Lanai. Please see Dan Jacobson, Karen Mancao or Amy Brumm for more information. Mahalo to all those who are currently serving this quarter! RIVER OF LIFE MISSION: Volunteers needed. We invite you to come and be a blessing to those less fortunate. Please join us Thursday, November 20th at 6:30 PM at the River of Life Mission located on North Pauahi Street between Maunakea and River Street. Free parking is available on the street. If you need more information, please see Duke Kauka. OPERATION CHRISTMAS CHILD: The Packing Party is Sunday, November 23rd at 1 PM on the Lanai. There is a sign up sheet on bulletin board. Please see Liz Santa Ana or Pastor Tau for questions. MAHALO! We truly appreciate all who took part in our Harvest Fest. Your prayers, donations and generous volunteer support made this event possible. May we continue to “press on” in sharing the love of Jesus to the community of Ewa Beach. SUNDAY NIGHT PRAYER: Please join us in the sanctuary tonight from 6 - ­ 7 PM for a time of corporate prayer. Jesus promised that if two of you agree on earth concerning anything you ask, it will be done by My Father in heaven. For where two or three are gathered together in My name, I am there in the midst of them (Matthew 18:19­-20). MID–WEEK COMMUNION SERVICE: Every first Wednesday of the month we set aside a time of worship, prayer and communion. We invite everyone to please join us in this special time of worship this Wednesday, November 5th at 7 PM in the sanctuary. IGNITE & IMPACT: The Junior High (6th-­8th) and High School (9th­-12th) groups will have an outing to i­Trampoline on Wednesday, November 12th. Please note that everyone participating should be here at the facility by 6:30 PM. Please see Pastor Felix for permission slips. We need to get a head count so please sign up on the bulletin board if you plan to go. WOMEN’S FELLOWSHIP BREAKFAST: Ladies, we invite you to join us for a time of worship and fellowship Saturday, November 15th from 8 -10 AM in the sanctuary. Please sign up on the bulletin board so we can plan for food preparation. PERFORMING HEARTS MINISTRY: Our “perFORMING heARTS” ministry will begin Christmas practices this Saturday, November 8th from 9 - 10:30 AM in classroom #1. Anyone interested in acting, stage set­up, costume design, lighting or dance, please come out and see how God can use YOU. Please see Kim Jacobson for more information. THANKSGIVING OUTREACH LUNCHEON: Each year we have been able to be a blessing to our elderly, less fortunate, military, and single parent families. Ko’Olina Resort will provide the food and we will serve our community with a complimentary Thanksgiving meal Saturday, November 22nd from 11:30 AM - 1:00 PM. If you are interested in donating (plates, cups, utensils, and napkins), sign–up sheets are posted in the foyer. SURVEY OF CANDIDATES: The 2014 Hawaii General Election is this Tuesday, November 4th. We have copies of the “Survey of Candidates,” sponsored by Hawaii Family Forum, available in the foyer. Please feel free to pick up extra copies to share. This survey includes questions on issues of interest asked of the candidates. PASTORS’ WIVES CONFERENCE: Ladies, please join us here in the sanctuary tonight and next Sunday, December 8th from 6 - ­8 PM to watch the video from the 2013 Pastors’ Wives Conference titled “With All Your Heart.” Please invite a friend and come be blessed by an exhortation from Proverbs 3:5­6. Please see Irene Couch for more information. SERVANT SCHOOL: There is no Servant School tonight or next Sunday, December 8th due to the Pastor’s Wives Conference Video. The study will resume in January. Please note that the Afterglow is Sunday, December 15th at 6 PM. Please see Pastor John for questions. SEGUE: Please note that Segue, our Young Adults Ministry, will resume meeting this Friday, December 6th with guest speaker Don Stewart. Please see Pastor Felix or Karen Tan for more information. CHRISTMAS EVE SERVICE: This year’s service will be Tuesday, December 24th at 6 PM. Children’s Church will be provided through 5th grade. Please use the enclosed flyer to invite someone to come and join us as we worship and praise HIS Holy Name. Additional fliers are available in the foyer. Please feel free to take as many as you need to pass out or mail. We invite you to bring your favorite finger food in a disposable container for everyone to share immediately following the service. VOLUNTEERS are needed for set–up, decorating and clean–up. Sign–up sheets are located in the foyer. CHILDREN’S MINISTRY: The new quarter begins Today. We still need assistance during the 8:30 service. We need a helper in the nursery and the 3rd - ­5th grade class. We also need a teacher for the 2’s and 3’s class. If you have been attending CCWO for about 6 months and consider this your home church, please consider volunteering for this vital ministry and be blessed by the children as we reach their heart for Christ! Please see Pastor John, Karen Mancao or Amy Brumm to sign up and to pick up a Volunteer Information Form. CHILDREN’S MINISTRY HOLIDAY SCHEDULE: We need Children’s Ministry volunteers for Wednesday, December 11th at 7 PM during our Mid­Week Service and also Tuesday, December 24th at 6 PM for our Christmas Eve Service. The sign­up sheet is on the bulletin board. Please see Pastor John for any questions. PHILIPPINES RELIEF FUND: If you would like to donate to the relief efforts in the Philippines, please make your check payable to CCWO and note that it is for the Philippines fund. All donations will be sent to Calvary Chapel Costa Mesa and 100% will be used for the Philippines. LADIES CHRISTMAS PARTY: All ladies are invited to the Daughters of the King Christmas fellowship Tuesday, December 10th at 6:30 PM in classroom #1 & #2. Please bring a Christmas treat or dish to share as well as a $5 gift to exchange. Please see the sign­up sheet on the bulletin board. For questions, please contact Abby Quast. MARRIAGE CONFERENCE: Please mark your calendar for Family Life’s, “the art of marriage–getting to the heart of God’s design” here on Friday, February 7th and Saturday, February 8th. Please see the enclosed flyer for more information. Please see Rosie Lactaoen on the Lanai to sign up. MEN’S SOFTBALL: Attention all Men! The 2014 softball season will begin January 25th and run through May 17th. There is a sign–up sheet located on the bulletin board. GUEST SPEAKER: Pastor Don Stewart is speaking next Sunday, December 1st at both of our morning services. Don is the host of the nationally known radio program “Pastor’s Perspective.” Please invite a friend and come be blessed! OPERATION CHRISTMAS CHILD: The Packing Party is today at 1 PM in the sanctuary. Please see Liz Santa Ana or Pastor Tau for questions. SERVANT SCHOOL: Please join us tonight at 6 PM in the sanctuary as we study how to interpret prophecy. Please see Pastor John for more information. SEGUE: Please note there will be no Segue this Friday, November 29th. They will resume meeting the following Friday, December 6th with guest speaker Pastor Don Stewart. SEGUE MISSION TRIP: Our Young Adults Group “Segue” will be ministering at Shoreline Church in New Zealand with Pastor Dave Heitman in October 2014. Please use the enclosed Panda Express fundraising flyer today from 12 PM ­- 8 PM to support them! Please see Pastor Felix for any questions. PASTORS’ WIVES CONFERENCE: Ladies, please join us here in the sanctuary Sunday, December 1st and December 8th from 6 - ­8 PM to watch the video from the 2013 Pastors’ Wives Conference. Please see Irene Couch for more information. MEN’S BREAKFAST CANCELLATION: Please note there will be no Men’s Fellowship Breakfast in November or December. They will resume Saturday, January 25th at 7 AM. Please see Whitney Vellalos for information. CHILDREN’S MINISTRY: The new period begins next Sunday, December 1st. Please prayerfully consider becoming a part of this ministry and be blessed by the children as we reach their heart for Jesus. Teachers, assistants, and worship leaders are needed. Full curriculum is provided. If you have attended CCWO for about 6 months and desire to serve, the sign–up board is located on the Lanai. Please see Pastor John, Karen Mancao or Amy Brumm for more information. CHILDREN’S MINISTRY HOLIDAY SCHEDULE: We need Children’s Ministry volunteers for Wednesday, December 11th at 7 PM during our Mid­Week Service and also Tuesday, December 24th at 6 PM for our Christmas Eve Service. The sign­up sheet is on the bulletin board. HOME FELLOWSHIP CANCELLATION: Please note the Iroquois Point study meeting at the home of Dan and Kim Jacobson is cancelled for Saturday, November 30th. They will resume the following Saturday, December 7th at 3 PM. Please contact Dan with questions. CCWO DIRECTORY: Anyone with the ability to produce our Fellowship Listing, please see Pastor Felix or Amy Brumm. MARRIAGE CONFERENCE: Please mark your calendar for Family Life’s, “the art of marriage–getting to the heart of God’s design” here on Friday, February 7th and Saturday, February 8th. There is a sign­up sheet on the bulletin board. Please see Rosie Lactaoen for more information. THANKSGIVING OUTREACH LUNCHEON: Each year we have been able to be a blessing to our elderly, less fortunate, military, and single parent families. Ko’Olina Resort will provide the food and we will serve our community with a complimentary Thanksgiving meal this Saturday, November 23rd from 11:30 AM – 1:00 PM. PLEASE USE THE ENCLOSED FLYER TO INVITE SOMEONE IN NEED. Additional flyers are available in the foyer. PASTORS’ WIVES CONFERENCE: Ladies, please join us here in the sanctuary Sunday, December 1st and December 8th from 6 -­ 8 PM to watch the video from the 2013 Pastors’ Wives Conference. Please see Irene Couch for more information. CHILDREN’S MINISTRY: The new period begins Sunday, December 1st. Please prayerfully consider becoming a part of this ministry and be blessed by the children as we reach their heart for Jesus. Teachers, assistants, and worship leaders are needed. Full curriculum is provided. If you have attended CCWO for about 6 months and would like to serve, the sign–up board is located on the Lanai. Please see Pastor John, Karen Mancao or Amy Brumm for more information. Our deep appreciation to all those who are currently serving this quarter! RIVER OF LIFE MISSION: Volunteers needed. We invite you to come and be a blessing to those less fortunate. Please join us this Thursday, November 21st at 6:30 PM at the River of Life Mission located on North Pauahi Street between Maunakea and River Street. Free parking is available on the street. For more information, please see Duke Kauka. MEN’S FELLOWSHIP BREAKFAST: Attention all men! We will have our monthly Men’s Fellowship Breakfast Saturday, November 30th at 7 AM here in the sanctuary. We invite you to bring a friend and join us for a time of worship and fellowship. Please see Whitney Vellalos for information. GUEST SPEAKER: We are blessed to have Pastor Don Stewart scheduled to speak Sunday, December 1st at both of our morning services. Don is the host of the nationally known radio program “Pastor’s Perspective.” Please invite a friend and join us! SEGUE: Please note there will be no Segue Friday, November 29th. They will resume meeting the following Friday, December 6th with guest speaker Pastor Don Stewart. SEGUE MISSION TRIP: Our Young Adults Group “Segue” will be ministering at Shoreline Church in New Zealand with Pastor Dave Heitman from October 1st ­ 14th, 2014. Please use the enclosed Panda Express fundraising flyer to support them! HULA OUTREACH: We invite you to come and support Nã Hula O Kaleiokapualani for an outreach performance at Pearlridge Center Downtown today at 2:30 PM. LADIES CHRISTMAS PARTY: All ladies are invited to the Daughters’ of the King Christmas fellowship Tuesday, December 10th at 6:30 PM in classroom #1 & #2. Please bring a Christmas treat or dish to share as well as a $5 gift to exchange. Please see the sign­up sheet on the bulletin board. For questions, please contact Abby Quast. MEN’S SOFTBALL: Attention all Men! The 2014 softball season will begin January 25th and run through May 17th. If you are interested, please see Marcus Stubblefield or Jesse Aragon. There is a sign–up sheet located on the bulletin board. VETERAN’S DAY: We thank our Lord and express our appreciation for all Veterans as well as all the Military men and women serving our country. Please note that the church office and facility will be closed in observance of Veteran’s Day tomorrow November 11th. THANKSGIVING OUTREACH LUNCHEON: Each year we have been able to be a blessing to our elderly, less fortunate, military, and single parent families. Ko’Olina Resort will provide the food and we will serve our community with a complimentary Thanksgiving meal Saturday, November 23rd from 11:30 AM – 1:00 PM. Please use the enclosed flyer to invite a Veteran or someone in need. Additional flyers are available in the foyer. IGNITE: The Junior High Group (6th­8th Grade) will be going to i­Trampoline this Wednesday, November 13th. Please note that everyone participating needs to be here at the facility by 6:30 PM. Please see Pastor Felix or Karen Tan if you have any questions or need a permission slip. AFTERGLOW BELIEVERS’ MEETING: Please join us next Sunday, November 17th at 6 PM here in the sanctuary. “The new birth is not the end but the beginning. The end no man has yet discovered. Having found God do we no longer need to seek Him?” (A.W. Tozer). Let’s seek the Lord through worship, prayer, the Word and the ministry of the Holy Spirit. Please see Pastor John for more information. RIVER OF LIFE MISSION: Volunteers needed. We invite you to come and be a blessing to those less fortunate. Please join us Thursday, November 21st at 6:30 PM at the River of Life Mission located on North Pauahi Street between Maunakea and River Street. Free parking is available on the street. For more information, please see Duke Kauka. GUEST SPEAKER: We are blessed to have Pastor Don Stewart scheduled to speak Sunday, December 1st at both of our morning services. Don can be heard with Pastor Brian Brodersen on the nationally known radio program “Pastor’s Perspective.” Please invite a friend and join us! SEGUE: Please note there will be no Segue Friday, November 29th. They will resume meeting the following Friday, December 1st with guest speaker Pastor Don Stewart. HULA OUTREACH: We invite you to come and support Nã Hula O Kaleiokapualani for an outreach performance at Pearlridge Center Downtown today at 2:30 PM. For more information, please see Bobby or Hi’ilei Silva. SERVANT SCHOOL: Please join us tonight at 6 PM here in the sanctuary as we continue our study on understanding and applying the Bible. Please see Pastor John for more information. MONDAY NIGHT PRAYER: Please note there will be no Monday night prayer for November and December. Beginning January 2014, we will meet the first Sunday of the month at 6 PM for a time of corporate prayer. MUSICAL GUEST: Please join us this Wednesday, November 6th at 7 PM here in the sanctuary. Perry Springman of “Perry and the Poorboys” will be with us for a special time of worship, prayer and communion. Invite a friend and come be blessed! MY HOPE WITH BILLY GRAHAM: There will be a unique opportunity for evangelism with Billy Graham this Thursday, November 7th. Billy will present the gospel by video across our land through thousands of homes and churches. Please see Pastor John or Pastor Kelly at the table on the Lanai for a Broadcast Schedule. THANKSGIVING OUTREACH LUNCHEON: Each year we have been able to be a blessing to our elderly, less fortunate, military, and single parent families. Ko’Olina Resort will provide the food and we will serve our community with a complimentary Thanksgiving meal Saturday, November 23rd from 11:30 AM – 1:00 PM. If you are interested in donating (plates and utensils), sign–up sheets are posted in the foyer. AWANA “LISTENERS”: Opportunities are available to assist our Awana Clubs as “listeners.” It’s easy and fun! Please prayerfully consider getting involved. There is a sign­up sheet on the bulletin board. Please see Pastor John or Susan Fuchikami for any questions. IGNITE: The Junior High Group (6th - ­8th Grade) will have an outing to i­Trampoline Wednesday, November 13th. Please note that everyone participating needs to be here at the facility by 6:30 PM. Permission slips and further details will be provided this Wednesday, November 6th. Please see Felix or Karen Tan for questions. CHILDREN’S MINISTRY: The new period begins next Sunday. Please prayerfully consider becoming a part of this ministry and be blessed by the children as we reach their heart for Jesus. Full curriculum is provided. Please see enclosed insert for current needs. If you have attended CCWO for about 6 months and would like to serve, the sign–up board is located on the lanai. Please see Pastor John, Karen Mancao or Amy Brumm for more information. Please see Pastor John if you have not picked up a Volunteer Sign Up Form. Also, if you signed up to teach, your curriculum is available at the Children’s Ministry table on the lanai. YOUTH MINISTRY: ATTENTION all those in Junior High and High School! Please join us this Thursday from 6–8 PM here at our facility. We will have a BBQ as well as a great time of fellowship and fun. So invite a friend and come be a part! Please see Pastor Dean, Hendrik Feliciano or Frank DeCoite for details. MONDAY NIGHT PRAYER: We invite everyone to pray with us Monday, December 3rd at 7 PM right here in the sanctuary. We want to encourage you to consider making the time for this precious opportunity of intercessory prayer for all believers in Christ. Please see Pastor Tau for more information. DAUGHTER’S OF THE KING: All ladies are invited to a Christmas fellowship on Tuesday, December 4th at 6:30 PM at the home of Abby Quast. Please bring at least a dozen of your favorite cookies to exchange as well as a small gift ($5.00 limit). For more information or to sign up, please see Abby Quast on the lanai. MID–WEEK COMMUNION SERVICE: Every first Wednesday of the month we set aside a time of worship, prayer and communion. We invite everyone to please join us in this special time of worship and fellowship Wednesday, December 5th at 7 PM in the sanctuary. AWANA: Mahalo to those who have signed up. Required training will be Friday, December 7th from 7–9 PM and Saturday, December 8th from 9 AM–Noon here in the sanctuary. If you have yet to do so, please see Pastor John for a Volunteer Sign Up Form. CHRISTMAS PARTY: Our CCWO Christmas Party is scheduled for Sunday,December 16th. Please see the enclosed insert for more information. If you plan to attend, please sign up after either service on the lanai. HOSPITALITY MINISTRY: We are looking for some friendly people to serve at our Welcome Table. If you have been attending CCWO for about 6 months and consider this your church home, this is a great ministry opportunity. For questions, please see Pastor Tau. NEW BABY: Congratulations to Ray and Alana Jones on the birth of their son Nathaniel Ray Jones. He was born on November 7th and weighed in at 8lbs. 4oz. and measured 20 & 1/2 inches in length. GUEST SPEAKER: We are blessed to have Don Stewart scheduled to speak next Sunday at both of our morning services. Don can be heard with Pastor Chuck Smith on the nationally known radio program “Pastor’s Perspective.” Please invite a friend and join us! CHILDREN’S MINISTRY: The new period begins Sunday, December 2nd. Please prayerfully consider becoming a part of this ministry and be blessed by the children as we reach their heart for Jesus. Teachers, assistants, and worship leaders are needed. Full curriculum is provided. If you have attended CCWO for about 6 months and would like to serve, the sign–up board is located on the lanai. Please see Pastor John, Karen Mancao or Amy Brumm for more information. Our deep appreciation to all those who are currently serving this quarter! YOUTH MINISTRY: ATTENTION all those in Junior High and High School! Due to scheduling conflicts, the date has changed. Please join us Thursday, November 29th from 6–8 PM here at our facility. We will have a BBQ as well as a great time of fellowship and fun. So invite a friend and come be a part! Please see Pastor Dean, Hendrik Feliciano or Frank DeCoite for details. SEGUE: Please note that our young adults group is cancelled this Friday. Segue will resume meeting Friday, November 30th at 7 PM at the home of Felix and Karen Tan. CHRISTMAS PARTY: Our Christmas Party is scheduled for Sunday, December 16th. Please mark your calendar and plan to join us. More information coming soon! THANKSGIVING OUTREACH LUNCHEON: Each year we have been able to be a blessing to our elderly, less fortunate, military, and single parent families. Ko’Olina Resort will provide the food and we will serve our community with a complimentary Thanksgiving meal this Saturday, from 11:30 AM–1:00 PM. If you are interested in serving or donating (plates, cups, utensils, and napkins), sign–up sheets are posted in the foyer. FLAG PRESENTATION: In honor of Veteran’s Day, there will be a flag ceremony conducted by our Scout Ministry. AWANA: Approved Workmen Are Not Ashamed (2 Timothy 2:15). Beginning, January 2013. Awana is a proven ministry for evangelism and disciple making of children and parents too. Please prayerfully consider your part in this venture in faith. To get involved, please sign up on the bulletin board and join us for a meeting today after the second service in classroom #1. Please see Pastor John for any questions. BUS STOP (MUSUBI) MINISTRY: There will be a meeting today after the second service in classroom #5 for all those interested in this new outreach seeking to minister to the lost right outside our front door with the love of Jesus Christ. Please see Pastor Kelly for questions. AFTERGLOW: Please join us here in the sanctuary Sunday, November 18th at 6 PM as we gather for worship and prayer. As believers, we will seek the Lord and His Word for the ministry and gifts of the Holy Spirit. We would like to provide childcare for this service. Please pray with us for God’s provision. Please see Pastor John for more information. VETERAN’S DAY: The church office and facility will be closed tomorrow in observance of Veteran’s Day . We thank our Lord and express our appreciation for all Veterans as well as all the Military men and women serving our country. MONDAY NIGHT PRAYER: We invite everyone to pray with us tomorrow at 7 PM right here in the sanctuary. We encourage you to make the time for this precious opportunity of intercessory prayer for all believers in Christ. Please see Pastor Tau for details. MILITARY FAMILIES MINISTRY: In honor of Veteran’s Day weekend, we encourage our military parents to enjoy a date night Friday, November 9th. Free child care will be provided at the church in classrooms #5 & #6 from 6–9 PM. Please sign up each child on the bulletin board. Please see Jeramey or Rachel Lopez for any questions. RIVER OF LIFE MISSION: Volunteers needed. We invite you to come and be a blessing to those less fortunate. Please join us Thursday, November 15th at 6:30 PM at the River of Life Mission located on North Pauahi Street between Maunakea and River Street. Free parking is available on the street. For more information, please see Duke Kauka. THANKSGIVING OUTREACH LUNCHEON: Each year we have been able to be a blessing to our elderly, less fortunate, military, and single parent families. Ko’Olina Resort will provide the food and we will serve our community with a complimentary Thanksgiving meal on Saturday, November 17th from 11:30 AM–1:00 PM. If you are interested in serving or donating (plates, cups, utensils, and napkins), sign–up sheets are posted in the foyer. AWANA: Approved Workmen Are Not Ashamed (2 Timothy 2:15). Beginning, January 2013. Awana is a proven ministry for evangelism and disciple making of children and parents too. Please prayerfully consider your part in this venture in faith. To get involved, please sign up on the bulletin board and join us for a meeting next Sunday after the second service in classroom #1. Please see Pastor John for any questions. BUS STOP (MUSUBI) MINISTRY: There will be a meeting next Sunday after the second service in classroom #5 for all those interested in this new outreach seeking to minister to the lost right outside our front door with the love of Jesus Christ. Please see Pastor Kelly for questions. When God the Father spoke on that mountain, He proclaimed that Jesus was indeed the Son of God, that He was pleasing to God and we are to hear Him. What are we to hear? That He came to reveal the Father’s love and to die for the sins of the world (John 3:16), the ultimate expression of love. Everything Jesus did pleased the Father, leaving us an example to follow. That begs the question, are we pleasing to God? We can be by faith. “But without faith it is impossible to please Him, for he who comes to God must believe that He is and that he rewards those who diligently seek Him” (Hebrews 11:6). The best way to diligently seek Him is to be just like Jesus. Jesus said, “This is My commandment, that you love one another as I have loved you” (John 15:12). To love like Jesus is to have a heart for God and for people – especially the lost. Is that your heart? Do you seek to be just like Jesus? May you not only “Hear Him”, but also proclaim Him and His glorious plan of salvation! What a great truth made available to us in these verses. Do you know Christ today? It may be that you know of Christ because someone handed you a simple tract or shared a personal experience of what Christ has done in their life. Maybe you were invited to church and the worship or preaching caught your interest, or maybe the witness of someone’s lifestyle attracted you. As Jesus proclaims in verse 17, neither the words nor the actions of man will reveal who Christ is. You will only come to know Christ through the work of the Father in heaven and this revelation will come through His Spirit and the study of His Word. Please set aside time to let the living Word of God speak to you that you would not just know of Jesus but come to know Him as the one and only Son of the living God, your personal Savior, redeeming you from the grip of hell. This is what God foretold to Satan after Satan had deceived the woman into eating the fruit. I recently found out that when one is crucified they leave enough space between the feet and the crucifix to allow one to push up on the heels in an attempt to relieve the pressure of hanging on the cross. This causes a severe bruising on the heel. Jesus, hanging on the cross and being the blood sacrifice for our sins, bruised his heel and in doing so crushed the serpent’s head – defeating death and reconnecting us with God once and for all. Growing up in the Midwest, I can vividly remember living through many tornadoes. When the sirens would start to blare, we would run for cover to escape the danger. The safest places would be in cellars or somewhere protected by the foundation of the house. It seemed the houses destroyed most frequently were mobile or prefabricated homes. The safest were those built with a strong foundation and solid construction. In Matthew 7:24–27, Jesus tells the parable of the builders. Of interesting note, the parable says, “…the rain descended, the floods came, and the winds blew and beat on that house…” It didn’t say “if” these things happened, they did happen. Trials come that challenge the strength of our house (life)…it’s inevitable. What protects us during the storms is the foundation our life is built upon. Also, when we’ve been constructed solidly (through faith), we are more secure in the storms. God bless and build wisely. I can be pessimistic, and no I’m not always thankful. Now you know—I’m not perfect. But God is, and He loves us in a way we can’t imagine. The cross is the symbol of God’s love. He loved His son and gave Him for undeserving sinners. While trudging through my resume this week, I saw all the things God had allowed me to do while here in Hawaii. I shouted out praise to God! He was using my resume to remind me of how blessed I really am and how much He is woven into the details of my life. Sometimes we get so focused on our struggles that we forget all God has done for us thus far and just how faithful He really is. Paul said in Philippians 4:4 NLT, “Always be full of joy in the Lord.” Impossible you may say. When you accepted new life in Christ, you also received all of God’s promises. He promised to never leave you nor forsake you (Hebrews 13:5). He also said He is the author and finisher of your faith (Hebrews 12:2) and promised to take you to the place he prepared for you (John 14:3). If you’re weak, thank Him. It’s just another chance for God to be glorified through the finished work of His Son. So Rejoice! This tutorial will show how to optimize your HD video output for uploading to YouTube, or any other video hosting. These settings will provide the best output quality while keeping the file size as small as possible. 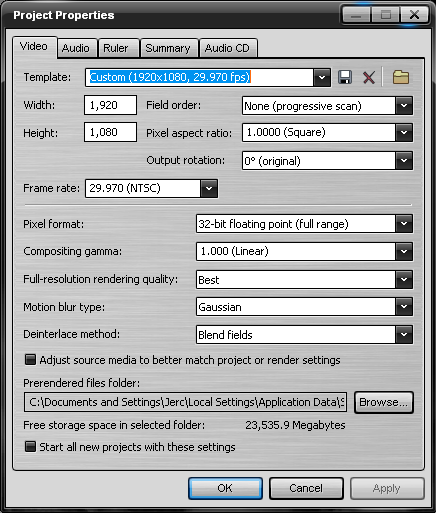 The screenshots are taken from Sony Vegas 9; however, the same settings can be applied on your video editing/encoding software of choice, given the settings are customizable. After you have completed the editing on your video and you're ready to render your output, first check to see your project settings. Set the project properties for 1080p progressive video. Note that setting the pixel format to 32-bit floating point (full range) is important to get accurate color representation. Using 8-bit usually results in a darker output, which leads to further darkening when uploaded and played on YouTube. After checking your project properties, go to 'File' on the menu, then select 'Render As' to select and set your final output settings. 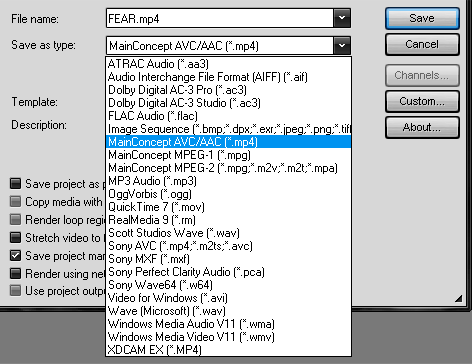 Select 'Mainconcept AVC/AAC' (which is the same as h.264), then click on 'Custom...' to customize the settings. 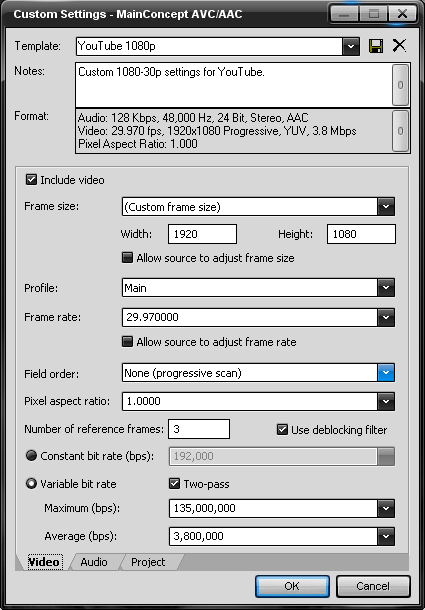 Select the 'Main' Profile, as well as your desired frame rate. The frame rate setting would depend on your source video. 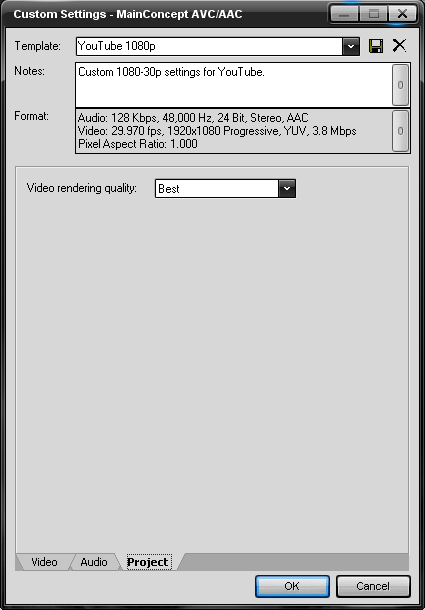 Set the reference frames to 3 since the video is mostly full motion, meaning there is little benefit in using lots of reference frames, which will only greatly lengthen the encoding time (though Sony Vegas may sometimes change this automatically). If your source video is animation, however, (or any video with repetitive motion) using more reference frames may help reduce your output file size and/or improve quality. And as seen on the image, set the average bit rate to 3.8 Mbps (which I will later explain why). The maximum 135 Mbps is just a ceiling based on the maximum Main profile bit rate for level 5 AVC/h.264. It doesn't have to be this high, but it doesn't really impact the output file size. You can adjust this if you want, but don't set this too close to the average value, as the encoder will limit the bit rate in a certain scene that may require a higher value. 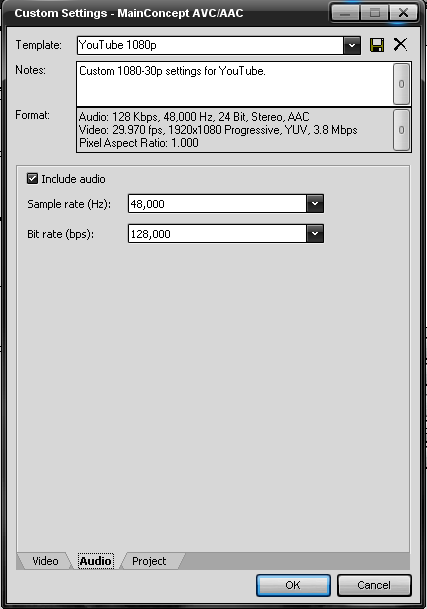 Set the sample rate to 48 KHz and the bit rate to 128 Kbps. Project settings, set to Best. Then simply proceed with your render and you're done! I am still troubled by a statement made years ago back in Oregon. I was going through a trial and a friend said to me, “I’m sorry, but all I can do for you is pray.” It was as if his first choice would have been to solve my problem. But that not being possible, his last choice, his default solution, was to pray for my situation. So how important is prayer? The disciples witnessed Jesus raise the dead, heal the sick, feed the multitude, cast out demons and preach the word, but they didn’t ask to be taught to do any of those things. The one thing they observed Jesus do that they asked Him to teach them is found in Luke 11:1, “Lord, teach us to pray…” And, Jesus said in Matthew 21:13, Mark 11:17 and Luke 19:46, “My house shall be called a house of prayer…” So, is prayer important? Does it work? Ask the little girl who attended the “Pray for Rain” service at her little church in a drought-stricken, Mid-Western community—she’s the only one that brought the umbrella. In Luke 17:12-16, the bible talks about the ten lepers that Jesus healed. One of them, when he saw that he was healed, returned, and with a loud voice he glorified God and fell down at His feet, giving Him thanks. He was a Samaritan and a leper which is considered a social outcast. We also were considered as outcasts which at that time we were without Christ, being aliens from the commonwealth of Israel and strangers from the covenants of promise, having no hope and without God in the world. But now in Christ Jesus, we who once were afar off have been brought near by the blood of Christ (Ephesians 2). And like the Samaritan who came and gave thanks because he was no longer an outcast; we, in the same manner should also come and give thanks because we are no longer an outcast from God. So by God’s grace let us always be that one who comes back and give thanks for our salvation that is only found in our Lord and Savior Jesus Christ. PRAISE JESUS! HAVE YOU CONSIDERED SERVING THE LORD? Kahiau is a Hawaiian word which means to give freely without expecting anything in return. Ku'aku'ai is another Hawaiian word for giving, but it means to give for the sake of receiving something in return. It is the very question that was asked of Adam and Eve after they had sinned against God in the Garden of Eden.